Figure 4. Water Pump Cover. 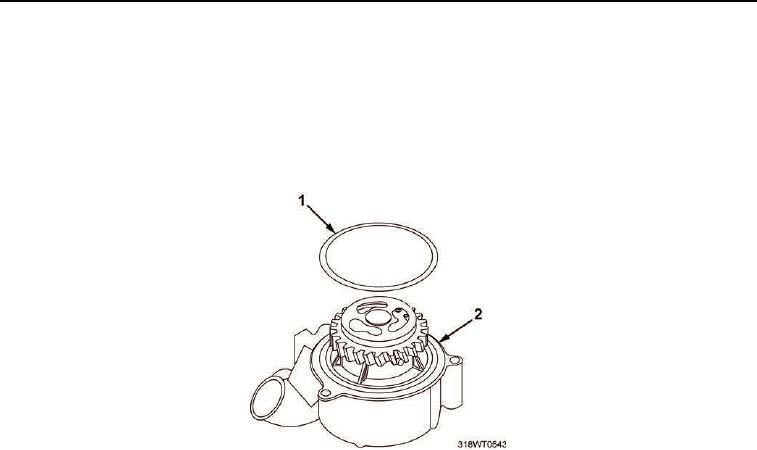 Place new ring seal (Figure 3, Item 1) on fresh water pump body (Figure 3, Item 2). Do not damage gear teeth when engaging the pump gear to front camshaft gear. Mount pump body (Figure 3, Item 2) on engine so that the pump gear meshes with camshaft gear. back bolt of the water pump. washers (Figure 2, Items 4 and 5) and lockwasher (Figure 2, Item 2). cover (Figure 4, Item 3) and cover gasket (Figure 4, Item 2). Install a 5/16- in. X 18X2 bolt (Figure 5, Item 3) in the impeller (Figure 5, Item 2) puller hole. Gear backlash setting should be 0.001 to 0.006 in (.025 to .15mm). Using a dial indicator, measure the backlash at bolt (Figure 5, Item 3) in impeller (Figure 3, Item 6). pivot pump body (Figure 2, Item 1) about the dowel pin to obtain proper lash adjustment. to 420 to 456 in-lb (47 to 52 N·m).